As marketing becomes more and more advanced, personalized marketing is critical. 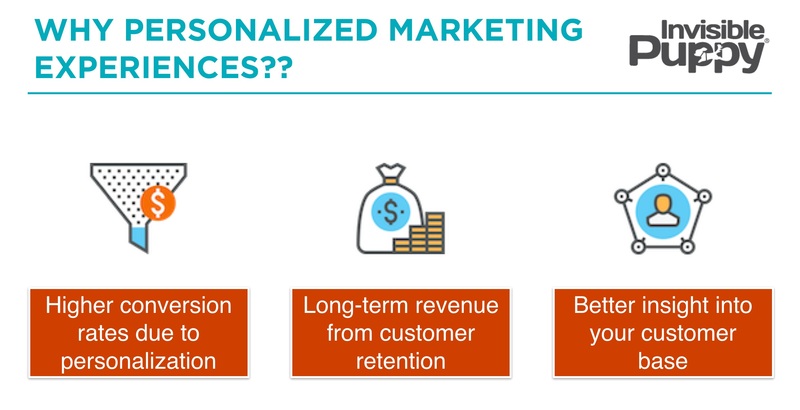 Personalization in marketing is real, needed and possible. It re-enforces your brand, and can mean the difference between being competitive or disappearing into oblivion. But how do you that ? People tend to respond better and be of greater value to your business when they feel their needs and interests are being specifically addressed in personalized communication. Likelihood of buying: When your marketing messages are relevant to the situation of customers and their interests, they are more likely to buy. Increasing customer lifetime value: Focusing on increasing the lifetime value of each customer as much as possible by making your marketing contextual is a key driver of long-term profitability. Better insight into customer base: Examining the performance of certain customer segments provides important insight into the health of your customer base, enables you to spot trends and patterns in what’s working and what isn’t, and can help inform your strategy going forwards. Discover the right new customers: using behavior and customer look-alike analytics your can inform your targeting strategy. Cross-sell, upsell and affinity models: customers build a history of interactions through service requests, product use, and other communications. You can use this insight to fuel product recommendation to customers, or products recommendations for account managers if that makes sense for your business. Lead analytics and lead scoring can prioritize incoming leads, help you acquire high quality leads and grow existing customers. Churn models: predict customer churn, and counter churn with churn campaigns Loyalty models: using customer data, specific strategies can be developed towards most profitable customers, or strategies to retain customers. 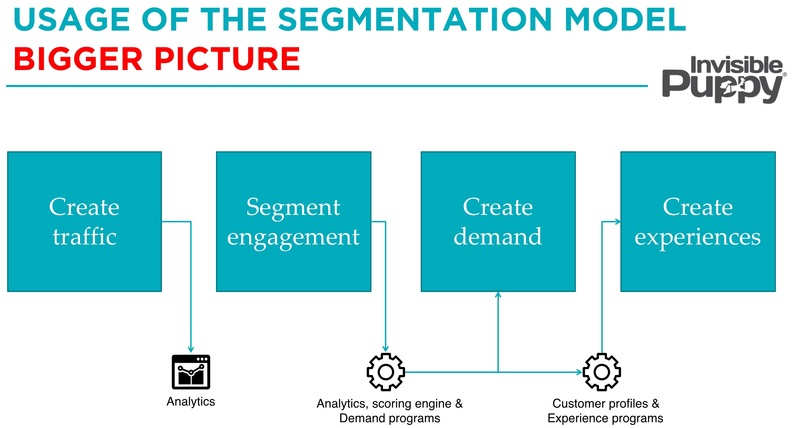 The absolute first step in personalization is having a segmentation model . It sounds boring, and it probably is. But it is critical to have your segmentation model mapped out. As marketers, we sit on piles of CRM data, transactional data, web-analytics and email addresses. But when we need to communicate with customers, we still take the widest possible segment because we have do not have the time, or the tools, or the insight to personalize our messages. That’s the typical situation. Sorry to put you on the spot, but I think in the majority of marketing organizations there is little room for personalization beyond addressing someone with his/her first name. Hey, I’ve been there myself. When you go into your CRM system, it turns out your segmentation model is not entirely what you need, and you widen your segment because the list seems too small. Do you recognize the situation? You want to personalize, but the segmentation criteria you use in your systems are not adapted. Let’s fix that by adding segmentation criteria to the model that allow us to personalize the marketing experiences of our customers. demographic segmentation: this is the most basic segmentation. This can be gender, age, income, and more. geographic segmentation: this is all about where the customers is located. psychographic criteria: this is all about who the customer really is. behavioral criteria: this is all about what the customer does when he is seeking the value you bring with your products or services. Cluster your segmentation criteria into product, category, marketing application, … and work your way towards more customer centric segmentation criteria you have or should have. Most segmentation models contain elements on market segmentation, application and product segmentation. That’s most commonly found. Most of us also have access to CRM segmentation which gives us some contact and account segmentation, but that’s it. And transactional systems like ERP or invoicing systems give us monetary data. The problem is that we don’t have the interests of customers in the model, nor do we have the behavior in the model… In essence, most segmentation models are built around brands , and not around customers. But which segmentation criteria do we need to add? To answer that question, the easiest thing to do is to map out your current segmentation model. Cluster these segmentation criteria into product, category, marketing application, … and work your way towards more customer centric segmentation criteria you have or should have. Map these clusters along the customer journey. Data is nothing without strategy to monetize the data. You might have the segmentation model ready. And you might have the data. But without a strategy to monetize this all, you won’t get zip. Let’s take the example of a marketing organization in the retail industry. The business objective: the marketing managers wants to re-active lapsing customers. Lapsing customers are customers that have bought in the past, but for some reason they are buying less today. Micro-segmentation: to reactivate these lapsing customers, we want to address them with a contextual relevant message, because that is what is needed to win-back these lapsing customers. Using transactional data, lifestyle or interest data, and behavioral insight we build a micro-segment of these lapsing customers. Personalized communication: a demand generation program that runs automatically to this micro-segment will run on weekends, offering a 30% discount in the favorite category of our segment. This is just a small example how strategy can fuel a marketing program, through data and micro-segmentation. Each of these different stages contain different tactics. In the case of traffic building you have lot’s of possibilities, same thing goes for creating and capturing engagement. And the same goes for the other stages. engagement is then captured, segmented and interpreted by ea. a marketing automation system. based on this engagement, personalized campaigns or “demand generation programs” are executed on one-to-one basis. That’s it for this one. A very practical post this time, on how you can introduce more personalized marketing. Let me know what you think, and feel free to comment. Thank you for reading. If you like this post, why not subscribe to this blog?